The area is full of gardens and quiet roads lined with Georgian and Victorian buildings which convey a sense of wealth and luxury. For shopping, especially food and clothes' shopping, the King's Road is a must. The only underground station is in Sloane Square and the buses along the King's Road and Sloane Street get snarled in traffic. However the whole area around Sloane Square is now being redesigned with pedestrian precincts and many of London's luxury stores are opening up close to the square. 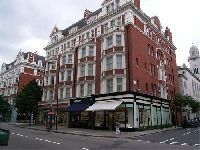 Just off the north end of Sloane Street you will find Harrods. Towards the river are Chelsea Gardens, home of the famous Chelsea flower show.